What Comes After the Big 3? These are the top three players in Korea’s idol scene, the names that hold the most strings in the K-pop arena. These three companies have pretty much dominated popular music in Korea after Seotaiji and the Boys bowed out in 1996, churning out young entertainers and constructing a whole star-training infrastructure. Legacies of pop groups and legendary solo singers can be traced down the timelines of these companies’ success stories. But I think a significant shift may be in the making. It’s only fifteen years later, yet the popular music game moves so fast that I think we may be entering into an age of new, diversified companies. I read two recent articles from Soompi News, the first one on Bae Yong Joon (established actor who hit hallyu stardom with his lead role in the K-drama Winter Sonata) getting read to create a new idol group under a company he’s heavily tied with as a stockholder, Key East Entertainment. Celebrities already included in his company’s catalogue include Kim Hyun Joong, Hwanhee (former idol under SM R&B duo, Fly to the Sky) and actress Lee Ji Ah (actress recently embroiled in divorce suits with Seo Taiji; acted in K-dramas Beethoven Virus and Athena). Kim Hyun Joong on the left, Bae Yong Joon on the right. The other article was on Kim Dong Wan, member of boy band Shinhwa, speaking on his bandmates’ upcoming endeavor to create Shinhwa Company. 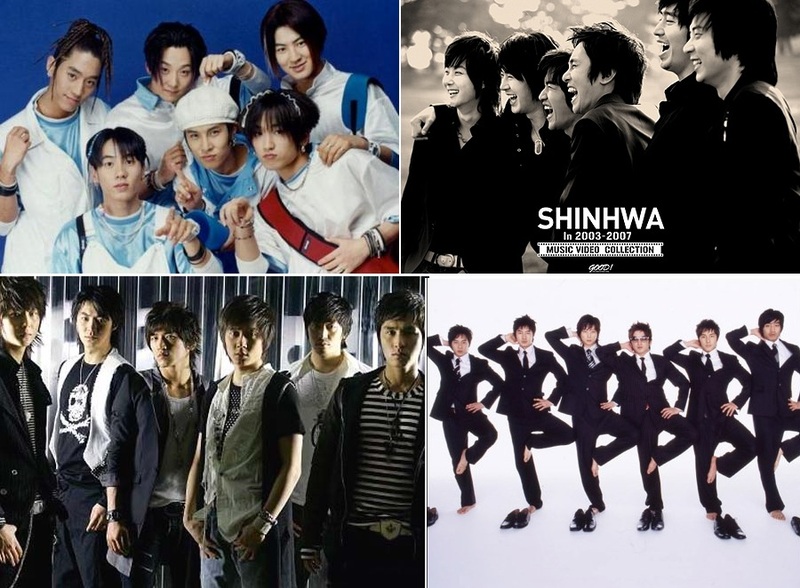 Shinhwa was another legendary group (by the way, 신화/shinhwa, literally means “myth” or “legend” in Korean) under SM entertainment, consisting of six boys who sang, rapped and danced. All of the group members left SM after their contract ended in 2003, also fighting to keep their group name in a court battle, which they won. Shinhwa is known for the tight relationship among the members and (therefore) them being the longest-running boy band in K-pop history. An article with further details on the new endeavor can be found at Allkpop.com. While it’s the stars under SM, YG and JYP who still hold top dollar and are able to make it across the nation’s borders to become hallyu stars, plenty of smaller companies back home in Seoul are not sitting idle (harhar, no pun intended, really). New singers like IU (solo female) and groups like B2ST (aka BEAST) are also hugely popular and up toward the top in Korea. And almost every star who has gained recognition from audiences outside of Korea started by getting the audience back home to love them. A new wave of idols from other companies means a growing surge of competition that combined may soon catch up to the heights of the Big 3. On the other side, the movement of past Big 3 idols to other companies after their contracts end also is a huge potential factor. Entertainers often leave their first company to sign under a company that offers them more freedom and perks; if able, they even start their own. Hwanhee, Shinhwa and Kim Hyun Joong (though he was under DSP, which is kind of like an under-the-shadow follower of SM) are all examples already previously mentioned. YG Entertainment seems to be an exception, though artists who aren’t signed under their main label and care such as Wheesung and Big Mama have ended up leaving. Nonetheless, when an entertainer moves, all the power and profit of the fans that adore them follows as well. It’s a shift that is in step with the widening scope of K-pop, as mentioned in a recent article done by BBC News. As K-pop continues to venture outside the domestic sphere, these companies which have been very successful but also hold such a tight grip will find themselves facing entertainers who will begin to demand more. The knowledge of what other arrangements are possible and the feeling that you’re being cheated can be very powerful impetuses. There will also be pressure from having to deal with countries whose way of thinking don’t so readily accept the Korean “old boys network” way of doing things, and a necessity to understand that other culture if they hope to gain real access and respect internationally. With smaller companies creating popular stars and established celebrities moving away from their main companies, I anticipate that the Big 3 will have to be innovative and flexible in both their entertainment concepts as well as their business practices if they hope to continue their successful legacy. South Korea’s pop industry is big business in Asia. As K-Pop sets its sights on Europe and the US, will this force a change in the way it treats its artists? This is why the biggest date in the Korean pop calendar – the Dream Concert, at which up to 20 bands perform – is held in Seoul’s 66,800-seat World Cup Stadium. Most of the bands, like Super Junior andWonder Girls, are household names; highly produced, sugary boy- and girl-bands with slick dance routines and catchy tunes. Industry leaders are also ambitious – Korean stars are beating a path to Japan, America and Europe. This month, South Korea’s biggest production company, SM Entertainment, held its first European concert in Paris, part of a year-long world tour. In April, Korea’s king of pop, Rain, was voted the most influential person of the year by readers of Time magazine. And earlier this year, boy band Big Bang reached the top 10 album chart on US iTunes. Follow the moneyKorea is excited by what this new musical export could do for its image – and its economy. But some of K-Pop’s biggest success stories were built on the back of so-called slave contracts, which tied its trainee-stars into long exclusive deals, with little control or financial reward. The court came down on their side, and the ruling prompted the Fair Trade Commission to issue a “model contract” to try to improve the deal artists got from their management companies. “Until now, there hasn’t been much of a culture of hard negotiation in Asia, especially if you’re new to the industry,” says Sang-hyuk Im, an entertainment lawyer who represents both music companies and artists. But Rainbow – currently in a seven-year contract with their management company, DSP – say that, despite working long hours for almost two years, their parents were “heartbroken” at how little they were getting paid. Musical exportsBut music sales in South Korea alone do not recoup that investment. For all their passion, home-grown fans are not paying enough for K-Pop. “But how do you slice a fraction of a penny, and give that to the artist? You can’t do it,” he says. With downward pressure on music prices at home, “many top artists make more money from one week in Japan than they do in one year in Korea”, Mr Cho says. Company representatives say concerts and advertising bring in far more than music sales. “Overseas markets have been good to us,” says one spokesman. South Korean musicians need to perform on home turf, but “Japan is where all the money is”. As acts start to make money overseas, he says this “broken business model” – underpricing – is creeping into their activities abroad. A former policy director at South Korea’s main artists’ union, Moon Jae-gap, believes the industry will go through a major upheaval. “Because at the moment, it’s not sustainable,” he says. South Korea’s government is keen to promote its new international identity, one many hope could rival Japan’s cool cultural image. Less than a month ago, YG’s main girl group 2NE1 released the digital single, “Lonely.” It’s a fun, fresh track, in two senses: It’s a nice contrast against the tide of poppy and/or electronic-based songs that has saturated the Korean gayo (domestic pop music) market, which YG is well aware of; people who have succeeded in pop music know that it’s as much about contrasting against what’s dominant in the market as keeping in mind the mainstream taste of the public, and YG’s top male group Big Bang also voiced their same intention of going against the electric tide with their recent release of “Tonight,” their fourth mini-album from February of this year. It’s also a different sound for the 2NE1 girls themselves, who rode the pop dance wave albeit with heavier beats. When listening to the song for the first time, it seemed to me as if the girls couldn’t shake off their in-your-face club style of singing. Some would say that these vocal qualities are what make 2NE1 recognizable, and while this may be true, I think retaining the same singing approach is at the expense of a singer’s skill to gauge a song as well as compromising the song itself. It is understandable to employ a forceful, even, penetrating technique when you’re backed by boomy basses and rainbow synths, but for a more sensitive song, I think the sound could have been adjusted to reflect this change while still remaining strong (like at 1:47). Instead, the voice of member Sandara Park (0:21), who has the weakest vocals of the group, comes off as the most fitting, although Minji’s vocals (0:11) are a nice medium. All in all, it’s a decent track that’s recognizable thanks to the titular chorus and YG magic. While I wasn’t totally satisfied with the delivery of the song, the girls’ vocals are steady as ever, and they’re enjoying continued success with “Lonely.” It’s been playing everywhere, and I even woke up to it blasting near my apartment building one morning. It’s always a plus for Korean celebrities if they can speak English well. At least, a glowing article about it always seems to surface, commenting on how impressive the actor or actress is. I remember spotting something a few years ago when Andy, the youngest member of boy band Shinhwa, had his own ten-second segment of English. The most recent fuss has been over Park Yoochun, former Dong Bang Shin Ki (DBSK) and current JYJ member. For those who don’t remember, DBSK was the biggest boy band of the current K-pop generation until three of the members, including Yoochun, decided to engage in legal action against their entertainment company. Since then, the three boys have been effectively barred from music activities and Korean broadcast. Having been forced to turn to other outlets, each has been venturing into different fields, and Park Yoochun has been fairly successful having entered into the world of Korean dramas. Acting is not at all a bad choice though. While most Asian pop stars have a finger in all parts of the entertainment pie, the move from music to acting seems almost necessary in Korea with idol careers having such short life spans. To be honest, as a past fan, Park Yoochun has always been my least favorite member of DBSK. But it’s interesting, and a good thing, I think, to see how these three are doing outside of and in spite of the antagonism from their former entertainment company, the ever-looming SM. So I watched his English speaking clip for fun, and while his accent isn’t bad! (he spent a few years in the USA), it always gets me, the way he pronounces his r’s. Things like “fur” or come out sounding like “fer.” It’s just so pronounced, and I suspect it might be because of the general difficulty Koreans (and Japanese) have with pronouncing r’s, as differentiated form l’s. This particular pronunciation comes out like an overcompensation from someone who’s tried to, or been trained to, overcome that phonetic hurdle. Just to clear any potential air, this post is not meant to be malicious and is not to belittle this person’s English (even if I am amused) or Koreans’ English in general, at all. As you can see from the video clip, some of his gestures and emphases are off as well… but it makes me wonder how cautious and/or horrified I should be about how my own Korean may come off to the native Koreans around me.